After reading great reviews about this I decided to go for the trial size. I added it to my night time routine, and after a couple of days my chin, cheeks and forehead erupted in sore red spots. I decided to stick with it, but to use every other day. After a week or so the spots began to calm down, and now my overall skin texture if so much smoother. Blackheads on my nose and t zone are smaller. My skin has never felt clearer. So definitely stick with it! I bought the trial size offer through facebook to try as i’d just about given up on my sun-damaged & uneven skintone. I’ve used it for 2 weeks after pure rosewater as a toner first, then a 2% retinol & vitamin c serum after it has dried & I can honestly say i’m impressed! My wrinkles & fine lines are less obvious & I have smoother skin & less redness. I’m here on the website to buy the full-sized bottle so thought i’d leave a review as well. Thank you so much :) I’m 55!! Only been using for a week so far. I have a combination skin. After first few days had lots of breakouts in the usual areas, meaning that the product have speed up the process of them coming through. Skin looks slightly better however it’s too early to say yet. I was suffering from hormonal spots and this does appear to be helping. It took a while for my skin to get used to it, as it did cause a little dryness and peeling around my nose (nothing a bit if extra moisturiser couldn't sort out). I started using twice a week but it's since I've increased to every other day it's made a big difference. Using this a week already impressed with skins condition! Using along side BP from doctors and this stuff keeps my skin from flaking! Something i could not get under control for the life of me! Now i can use my BP every night, skins feeling smooth, need to give a few days to 'get going' would reccomend to oily girls with blemishes and big pores. I've tried this and the Paula's Choice Extra Strength BHA (a.k.a. their Skin Perfecting 2% BHA Liquid), and unlike the latter which I found a bit too drying and left far too much shininess and stickiness on the skin, the Regular Strength BHA is lightweight and watery (i.e. more like what you would actually expect a liquid to be like), much more absorbent, and in my experience isn't the slightest bit drying or irritating. This is because they very wisely combined the salicylic acid with humectants like sodium hyaluronate and anti-irritants like dipotassium glycyrrhizate - which is derived from licorice root. Also, it's at a higher pH than the Extra Strength (3.9 as opposed to 3.5), which is still within the right level for the salicylic acid to work its exfoliative magic but without the irritation that comes with a more acidic pH. While the formula itself would earn 5 stars from me, I have to knock off at least one star for Paula's Choice's awful packaging for their liquid exfoliants. It seems the company doesn't understand that liquids can easily leak from bottles that aren't tightly sealed, so forget trying to travel with this bottle unless you want to deeply exfoliate the bottom of your suitcase. I've used liquid products from other companies and don't encounter this issue because they use more suitable bottle caps (pumps, for instance). I've noticed the leakage issue has been a common theme in their reviews and yet Paula's Choice has done nothing to address this issue. Funnily enough, the trial sizes for their liquid exfoliants DO have a cap that can be properly sealed, so I don't know why they don't simply replicate that design for their full size bottles. For now, I keep a trial size bottle handy and travel with that instead. I have very oily breakout prone skin and noticed fewer blackheads and spots when using this after an initial breakout period. I don't like the smell of this - to me it smells like sick but my trial size one didn't or least I didn't notice it. It really does work though I now use it morning and evening in place of a tee tree body shop toner which was probably making my skin worse -I have redness, oily skin, sensitive, breakout prone and psoriasis on my scalp and ears. This product also helps the psoriasis on my ears. I would definitely use this product again as I don't think there is anything like it on the uk market that I am aware of. This exfoliator is the best I have ever used. It has dramatically improved the appearance of my skin, I suffer from fewer spots, and it helps to regulate any oiliness. It also doesn't exacerbate any dry patches. I'd definitely recommend this from anyone suffering from spot prone, combination skin. My spots are a result of hormones, and this seems to be the only thing that can keep my skin under control. I actually use this as a wash-off last step in my morning & evening cleansing routine. The instructions suggest you leave it on, but I rather apply it with a cotton pad to damp skin, leave for a few seconds, then wash it off. It seems to exfoliate my face well and helps in preventing acne, possibly because when I'm washing my face the pores are open and it allows this product to enter the pores and do its work. In the morning, I will then just apply moisturiser in foundation. In the evening, I will then apply and leave on the 1% BHA Lotion after using this. I rather leave the lotion on my skin than this as it is very liquidy. But I have found that I must use both products - this 2% Solution as the last step in my cleansing routine, and the 1% Lotion as a leave-on overnight lotion. If I don't use both, the acne will break through! I can't begin to list the amount of products I have tried over the years, including medicine 3 times as a teenager. I never get big spots now, but just lots of spots under the skin that I can't get rid of. - particularly along my jaw, and cheeks. Any products I used just seemed to give me more spots. After a lot of research I decided the problem might be a build up of skin that needed gently removing. I'm delighted to say that I have seen an improvement in the smoothness of my skin. Also, the blackheads I do still get come out very easily. I am also using the hydra light face wash, the ultralight daily mattifying fluid and the Barely There foundation. I'm a total convert! To put this into context, I also tried a similar product from a well known online acne treatment company and a primer makeup for somewhere else and both immediately made my skin worse! I treated my acne two years ago, but I was still struggling with a couple of blackheads, dilated pores, oily skin and some stubborn pimples. In October I decided to give it a go - I slowly introduced this to my routine. Started by using it once per week and now I'm using it every two days. BHA and Retinol dramatically changed the appearance of my skin - it looks fresh, clean, glowy. I've used salicylic acid for years with great results, and tried Paula's choice after I couldn't get Peter Thomas Roth acne clearing gel in the UK anymore. But this product is impossible to apply properly - it's literally like water, so you can't transfer it from your hands to your face. The information recommends 'soaking' a cotton wool ball to apply it, but of course the wool just absorbs most of the solution, so hardly any gets transferred to the treatment area. Besides, cotton wool can cause skin irritation which can make acne worse. I tried the sample sachet first and it seemed to have a much higher viscosity than the full size product. Really frustrating considering the price. Customer Care: Thank you for your review. We are sorry to hear of your experience and discomfort. It seems that the sample sachet you have tried was for another BHA Exfoliant, which had a different texture and therefore the application method would've been different. Please contact our customer care team for further assistance. It has now been 4 months since I started using the product. I use it once a day as part of my morning facial routine. I did suffer from bad breakouts in my cheek region and they left rather unsightly scars on my cheek. After a lot of reading on the cause and management of acne, I decided to start a double treatment of salicylic acid (which comes from this product) and at night I apply a small dab on 5% benzoyl peroxide gel on the affected area which I got from the pharmacist at Boots (it doesn't require prescription).I am quite certain that the combination of these two products is what saved my skin. The pigmentation marks have slowly disappeared now and my skin looks so much better. I do get the occasional spot when I am on my period but they are not as big and they disappear much quicker than they used to. It should be noted that I only noticed a difference after 2 months. It is not a miracle product that will change you skin overnight but with patience this product will help your skin get better. Both salicylic acid and benzoyl peroxide are known to be quite drying on the skin so it helps to have a good oil free moisturizer! I've been using this twice a day (I built up to that) and it's made a huge difference. My skin looks better than it has done in years. There's no irritation or tingling, and I've actually found my skin has pushed out little blockages from my pores a few times - not as in a huge spot or breakout but just like my skin as got rid of the block without any inflammation. Amazing stuff. I bought trial versions and I'll definitely be getting the full size. I also want to try the Resist Pore-Refining 2% BHA Treatment. I have used this product for about 1 month now. My skin was somewhat clear of breakouts before and I bought this mainly to treat my blackheads and visible pores that bothered me. After using this for almost a month now the pores and blackheads are still there but I have pimples all over my face and it's worse than ever. I have continued using the product in hopes it'll improve and I will continue to do so for a while so here goes hoping it starts working soon, because the state of my skin really bothers me. Customer Care: Thank you for your review. We're sorry to hear about the experience that you've had when using this product. Unfortunately, not everyone reacts in the same way to skin-care ingredients, and some can be more sensitive to a particular ingredient than others. Our Customer Care Team will contact you by email about this issue. I don't normally write reviews but I felt I had to write for this. I've been using the product for about 10 days now....although my skin looks and feels smoother I have had a massive breakout, everywhere on my face. Big pimples just popping up. I know many things could have affected this such as environmental factors etc, but I wear spf and eat and drink very healthy but none of these help. I don't know if its an initial breakout period or what but in some ways my skin has gone very bad. Customer Care: Thank you for your review. If you experience a bout of breakouts after you begin using a BHA exfoliant, don't despair. Stick with the product for at least a month before you give up. In almost every instance, your skin will show a remarkable turnaround and improve with consistent use (if you like reduce to every other day for a while). This was my first paula's choice product which i bought in las december. The first bottle of this worked phenomenally on my skin. Almost cleared the blackheads and cleared most of my acne and kept my acne at bay. After seeing the results i bought 3 more bottles. But sadly now its doing nothing for my face. Almost at the first day of starting the second bottle i broke out in cystic acne. There was a gap of 4 months where i could not buy it bocause i dont live in UK. I had ship it by someone else from london. Now i guess it was a total waste. There are 2 bottles totally intact. I didnt even open them. I m really disappointed. I would like to give it back. Customer Care: We are sorry to hear of your experience and discomfort. Please contact us for further assistance. Kelly - Be patient, and the results are awesome. This time in February, I was pretty unconvinced by Paula's choice. I have combination skin, face completely covered in little blackheads, a pimple here and there, red marks where those pimples have refused to fade. I had tried the 2% Skin Perfecting BHA Liquid, and it had left my skin flaky and weird and somewhat worse-off than before I started using it. But I know my skin, and I know it's super sensitive and that particular product was perhaps too full-on. So I browsed the site, looked for something a little lighter, and decided on this one. For the first month and a half, nothing really changed. And then about a week ago, I woke up one morning, went through my usual pre-work routine, put on my make-up blablabla... and as I glanced at the mirror before walking out the door I had to do a little double take... because I hadn't seen my skin looking so damn good since... well... ever. And it wasn't because of the make-up I was wearing. Yes, I still have blackheads, but they are noticeably smaller. Yes, I still get a spot now and then, but they heal noticeably faster. My red marks are fading, and the overall smoothness and radiance of my skin without make-up is just incredible. Unbelievable. I use this product once a day, after my shower in the evening. At this point I have cleansed my face with a gentle foaming cleanser, then I just apply the product using a little cotton pad before I go to bed. Simples. But it takes time to work. And unless the product is actually doing harm (like the Skin Perfecting BHA liquid basically was), my advice is stick with it for at LEAST a month or two before you make up your mind. The results really are brilliant. Good luck my fellow combination-ers! I've been using this product for 4 weeks and my skin is a bit better, which means a lot to me. I'm 32 and in the last few months my face has apparently gone back to puberty. A friend reccomended this exfoliant to me and I can see a difference. Not massive, to be honest, but these things take time.Another important thing for me is that it's not causing a bad reaction to my skin. I have VERY sensitive skin and I get a rash with most cosmetiv products. But this one feels good. No dryness or itchyness despite I'm using it twice a day every single day. So I'm going to keep trying for a few weeks and see if it's really going to help me. this has such good reviews on here and makeupalley. but to me it felt like i was applying water and worked like i had applied water. i used this product for a few months and it never made a difference to skin (no better, no worse). i used it on a cotton pad, with finger tips, mixed with moisturisers.... such a shame. Thank you for your review. We are sorry to hear of your experience with these products. While the response you have indicated is not typical, we do understand that each customer is uniquely different in how they will respond to products or ingredients. This along with everyday environmental factors can sometimes play a part in how someone will ultimately respond to a product or combination of products. If you would like to discuss other options that may be better suited for your particular skin, please contact customer care. We are happy to help and can arrange to have samples right away. Alexandra - Didn't work for me sadly. I was so convinced by the reviews that this toner would be amazing, but I'm very disappointed to say that it has made no difference to my skin what-so-ever! There is no difference to the blackheads in my t-zone - not in the slightest! In fact, it gave me even more blemishes. It made me break out like never before - and my skin isn't even that bad. I'm really disappointed in this product. Customer Care :There can be some amount of time before getting the results. This can vary from person to person and ultimately depends on the extent of the condition or concern they are trying to address as well has how they are using the products. Some consumers will notice results promptly while others will notice results over the course of a few weeks or months. Ultimately, we would love for you to continue use the products to see how they will work for you but in the meantime will credit you for the CLEAR Targeted Blemish Relief Toner and encourage you to contact customer care so that we may discuss your skin type and how the products were being used. This is an amazing product - it does exactly what it promises to do, unclogs pores quickly and effectively. I live in the UK and there are very few products available on the high street that contain bha but no alcohol etc in. I will never be without it for this reason. I've been using this toner for about a week now since I swapped from Nick Lowes anti blemish toner(also BHA product). To be honest, this one doesn't seem to be as effective to me as my previous toner- in comparison it leaves my skin dryer , it hurts when it comes in contact with broken skin and anti blemish wise it does not seem to be more effective. However I will continue to use this and hope for mircales to happen! This product was unfortunately an absolute disaster for my skin. I really wanted to like it: I read all the positive reviews and thought it would be ideal for my oily, clog-prone skin. My skin was a little clogged, with a few blemishes after using too mild a cleanser. The first day the lotion quickly soothed existing blemishes, but tiny new ones to the surface on my cheeks. I presumed that this was an initial purging effect and would soon clear. However , over the space of four weeks my skin worsened, with many painful, inflamed eruptions - I'm in my fifties now and have never had so many cysts and pimples all at once, even in my teens, as I had after using this lotion. I discontinued the lotion two weeks ago and the inflammation began to subside, but was still severe enough for my doctor to prescribe a two month course of antibiotics. I've used BHA in other products without this effect, so it must be something else in the formula which proved extremely clogging for my particular skin. On the plus side, it did leave a nice finish and other products applied smoothly over it without balling up. It just wasn't suitable for my particular skin. Customer Care Response: Thank you for your review. We are sorry to hear of your experience with this product. While the response you have indicated is not typical, we do understand that each customer is uniquely different in how they will respond to products or ingredients. This along with everyday environmental factors can sometimes play a part in how someone will ultimately respond to a product or combination of products. Please contact customer care for a credit for this product. I started using this gradually on my sensitive combo skin, firstly twice a week and building up to daily. I can happily use this every day, even twice a day on my chin and forehead. It has taken time but my skin is certainly clearer, breakouts are much less frequent and clear up much, much faster. I don't use a toner (never have) I just use this now and sometimes the 2% BHA lotion if my skin feels a bit dry. I will never be without these products and now use a range of Paula's products (only this one from the clear line though). Highly recommended for blackhead prone skin. A million times more effective than any scrub! Jo - Excellent product for acne! 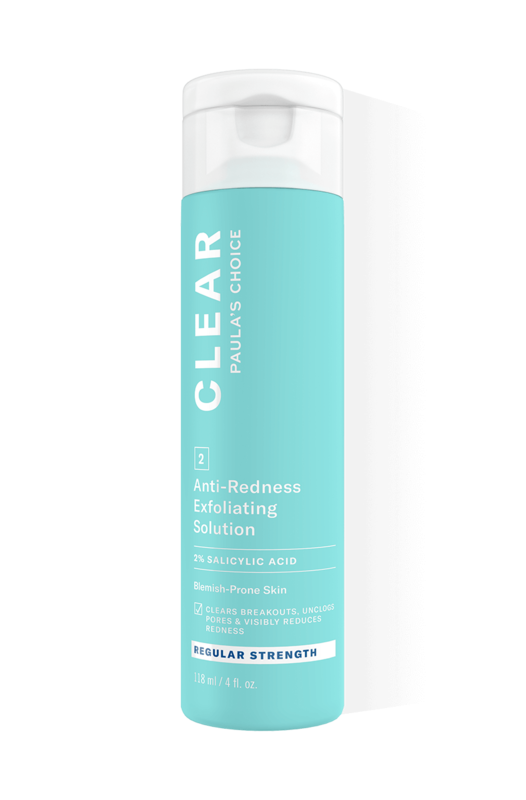 I have had trouble with acne for many years and I am now on my second batch of the CLEAR products from Paula's choice. My skin is glowing, and the acne has cleared up 10fold. It has not completely gone away as my acne is hormonal, but the products have definitely helped. I would recommend using the whole CLEAR system i.e. cleanser, toner, moisturiser and exfoliator, because I ran out of the toner and moisturiser at the end of last month, so used other products while the others ran out (to avoid buying items separately and paying the postage twice!) and I ended up with a huuuge breakout! Im back on it the whole system now and it has cleared up - learn from my mistakes - dont scrimp and buy/use the whole package consistenly for it to work! After having tried just about every product to try and rid myself of breakouts going through just about every skin type i think i am finally begining to understand why none of them has worked. I am enjoying using this product, it is non-drying - which has always been a problem for me in the past causing further breakouts - gentle, but very effective. After using it for five days, I can see a difference in my skin. Smoother and clearer and definately less sore looking. I am very pleased with this product and hope it continues to improve my skin. I always wondered why a lot of high street and department store products didn't work. Its because they don't work! So, don't believe the hype and the quackery around glitzey packaging and marketing speak. Instead buy products that work - this stuff DOES work. Having battled acne as a teen and adult I have to commend this fine lady on exactly the right combination of products to keep things under control. Her 2% BHA lotions coupled with a 2 or 5% benzoyl peroxide product (ask your local chemist for Pan Oxyl) applied sparingly has almost eliminated my acne. I cannot comment much on the product itself as I took it on holiday and when I arrived to my destination 75% of product was in my plastic bag. I was only able to use it a little and not enough to see if it works for me. The design of the bottle needs to be redesign cause when not placed in vertical the product spills. In my case it was a waste of money. I really like the product, its the first thing that has ever worked on my skin. Bottle needs to be rethought. Put it in my makeup bag and when I went back to it in the morning, half had leaked out. Customer Care: Thank you for your review. We're glad you're liking your CLEAR Regular Strength formula, however we are sorry that is has been leaking in your make up bag. Please contact our Customer Service team for further assistance. But the bottle itself is horrible, as another customer reviewed, mine tipped over as well and spilled half the content on the 30ml trial size bottle. I didn't even realize what had happened until I saw the wide gap on the back of the plastic lid. So I would rate the bottle with 1 star, as it does not keep the liquid securely in. Customer Care: Thank you for your review. We're glad you're liking the CLEAR Regular Strength formula! Regarding the bottle, it's a bit tricky however, as once a product has been used, especially liquids, it's quite difficult to keep it from seeping out unless the product is packaged in an air-reduction pump. Be sure to contact our customer care department for further assistance with this issue. Unfortunately I was only able to use the product just the once due to awful packaging. The bottle tipped over overnight (with the lid closed mind you) and was near empty in the morning. If packaging can't even contain an item when sealed it miserably fails on that front. Customer Care: Thank you for your review. We are sorry to hear of your experience and will be contacting you by email soon. Inge - Great, except the packaging! My partner and I have both been using this toner for the past couple of weeks. I have dry/sensitive skin and my partner has oily skin which is prone to breakouts. This is our first time using any products of paula's choice. This toner + the other products of the CLEAR range and a benzoyl peroxide product have managed to keep my partners acne mostly in control. He still has the occasional spot, but it is a massive improvement. I myself have only used the toner for the redness I get on my cheeks and nose and for me it has made a great difference. I feel confident enough to leave the house without make-up as the redness has reduced significantly. The only downside of this particular bottle I received is that it leaks when it is not kept upright, meaning I've lost quite a bit of the product. Because of this I have only rated it 4 stars instead of 5. Customer Care: Thank you for your review. We are sorry to hear about the bottle. We will send out a replacement. Helen - Redness is going!